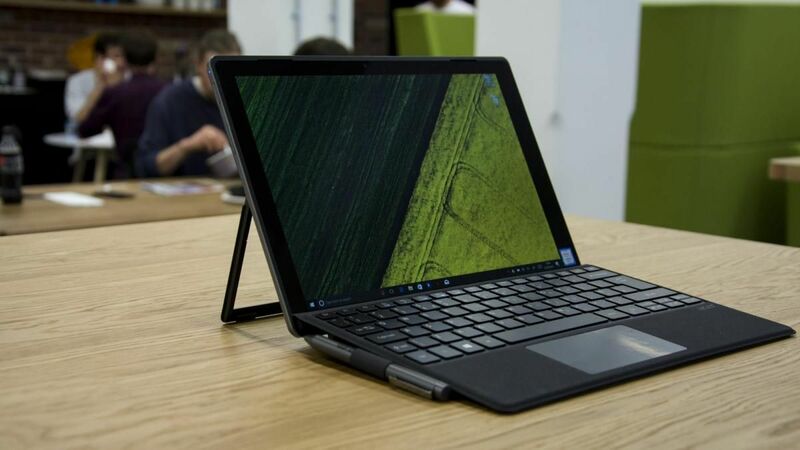 Microsoft’s Surface Pro showed a tablet could run Windows 10 just as well as a laptop, and it’s been successful enough to attract several imitators. 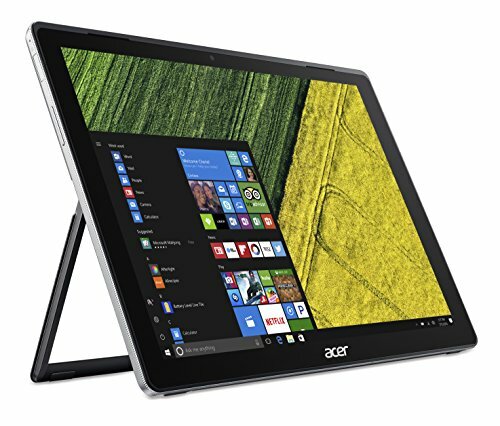 You can pay anything for a Surface Pro, depending on the specifications. 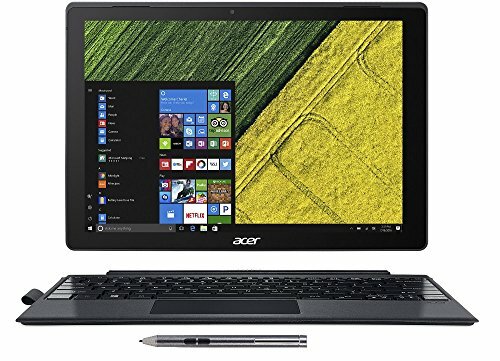 The nearest price to the Acer’s is , which gets you an Intel i5-7300U processor, 4GB of memory and a 128GB SSD. The Switch 5 comes with a very slightly slower i5-7200U, a much more sensible 8GB of memory and a 256GB SSD. To get those specs, Microsoft would charge you. 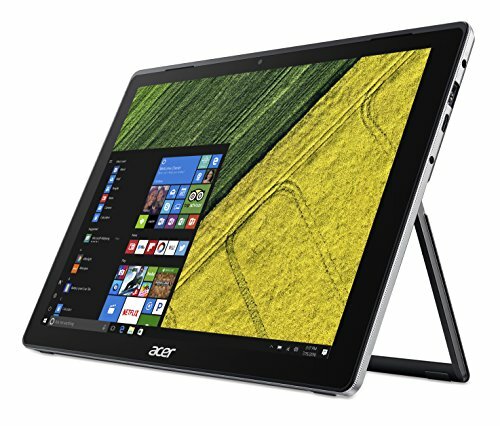 But the difference is even bigger, because Microsoft adds for the Surface Pro Type Cover and for the Surface Pen, while Acer includes a keyboard and stylus as standard. Don’t reach for your calculator, we’ve worked it out: the Switch 5 is over cheaper. Inevitably, that means a few compromises. Microsoft puts a lot of the extra money into the Surface Pro’s wonderful touchscreen, which covers 94.3 per cent of the sRGB color range with excellent accuracy and packs 2736×1824 pixels into its 12.3 inches. The 12in Switch 5 manages 2160 x 1440 pixels, which is still very sharp, but only 79 per cent of sRGB, with mediocre accuracy. In other words, there are fewer colors and even those don’t always match what was intended. Contrast and brightness are 50 and 30 percent lower than the Surface Pro respectively. the Switch 5, and we wouldn’t choose it for serious photo or video editing, for example. For general Windows 10 use, though, you should be satisfied. And the good news is that not much else shows any major corners cut. 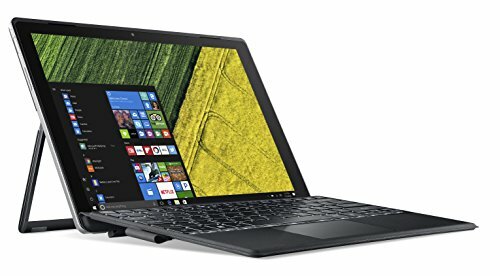 The black case is plain and simple, with a well-designed kickstand that, like the Surface Pro’s, lets the tablet sit firmly at any angle you want. The power button incorporates a Windows Hello fingerprint reader. 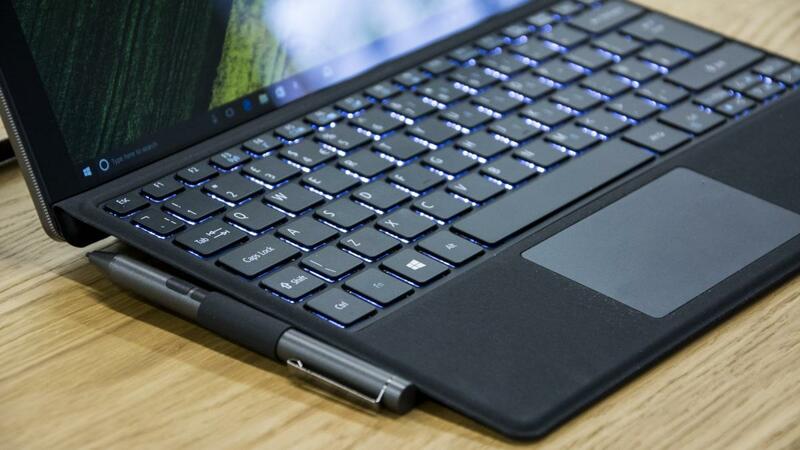 Without their keyboards, the Switch 5 is just over a millimetre thicker and 134g heavier than the Surface Pro. 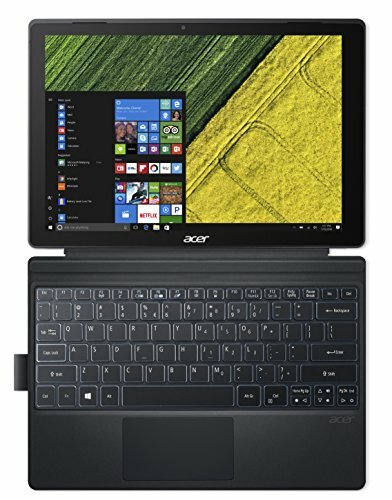 Acer’s magnetically attached keyboard is backlit and feels great – maybe not quite as refined as Microsoft’s Type Cover, but surprisingly solid and stiff, even when tilted up at the back for more comfortable typing. The built-in trackpad scrolled, zoomed and clicked reliably for us every time, which is more than can be said for rivals like the Lenovo Miix 510. Acer’s Active Pen lacks the Surface Pen’s tilt sensing, which can be used for subtle shading in some programs, but is pressure-sensitive and felt very responsive. 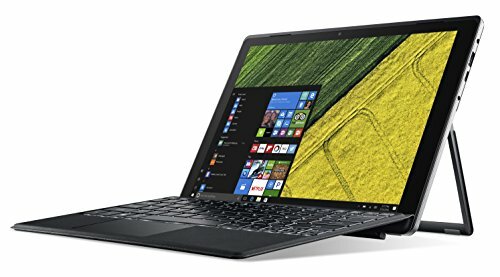 It would be unfair to compare the Switch 5 to our test results from the much pricier i7 version of the new Surface Pro, but the Switch 5’s overall score matched the previous Surface Pro 4 with the older i5-6300U chip. We’d expect Microsoft’s new i5-7300U model to be around 10 per cent faster at best, so the Switch 5 is no slouch. 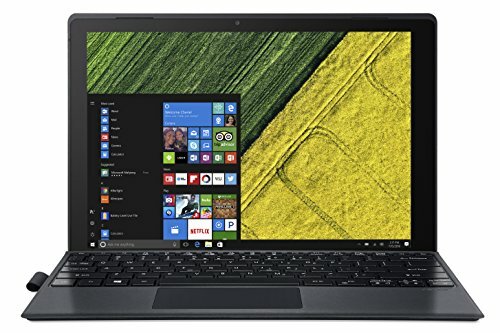 Its i5 chip is less than half as fast as a low-end i5 desktop PC processor, but fine for a wide range of tasks, and a big improvement on the m3 processor at the bottom of the Surface Pro range. The integrated Intel HD graphics card will run less demanding 3D games with quality settings turned down. Impressively, the Switch 5’s silent fanless design kept everything cool at all times, but the battery gave up nine minutes short of six hours in our video-playback test. That’s good for a laptop, but not much more than half the Surface Pro’s running time.